TALLAHASSEE, FL – The #20th-ranked Florida State Seminoles defeated Clemson 7-0 in an Atlantic Coast Conference men’s tennis match at Tallahassee, FL Saturday afternoon. Florida State, ranked 20th in the latest ITA poll improves its record to 11-3 overall and 4-0 in the ACC. The Tigers, ranked 29th nationally, suffer their first defeat of the season and drop to 15-1 overall and 1-1 in league play. 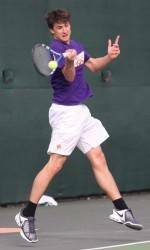 One bright spot for the Tigers was at number two doubles as the Tigers’ duo of Derek DiFazio and Wesley Moran upset the 60th-ranked doubles team of Jean-Yves Aubone and Clint Bowles 8-4. However, the Seminoles won at number one and number three doubles to clinch the team point. At number one singles, #22-ranked Jean-Yves Aubone defeated Clemson’s Carlos Alvarez 6-4, 6-3. Clemson will play host to South Carolina on Wednesday, March 24, at 2:00 p.m. in the Tigers’ next action. The match with the Gamecocks will mark the 101st meeting between the two schools on the tennis courts. The first match took place on April 13, 1925. The Gamecocks won that match 4-2 at Clemson. Five days later the Tigers won over South Carolina 4-2 in Columbia. The Tigers have won four of the last seven matches played in the series. Prior to today’s loss, the Tigers were 15-0. This was the school’s second best start in the 100 years of the program. The best start of the season was in 1969. The 1969 team finished that season with a perfect 16-0 record and won the school’s first ACC Championship. The Tigers were looking to tie the school record for the best start in Clemson history with a win today.